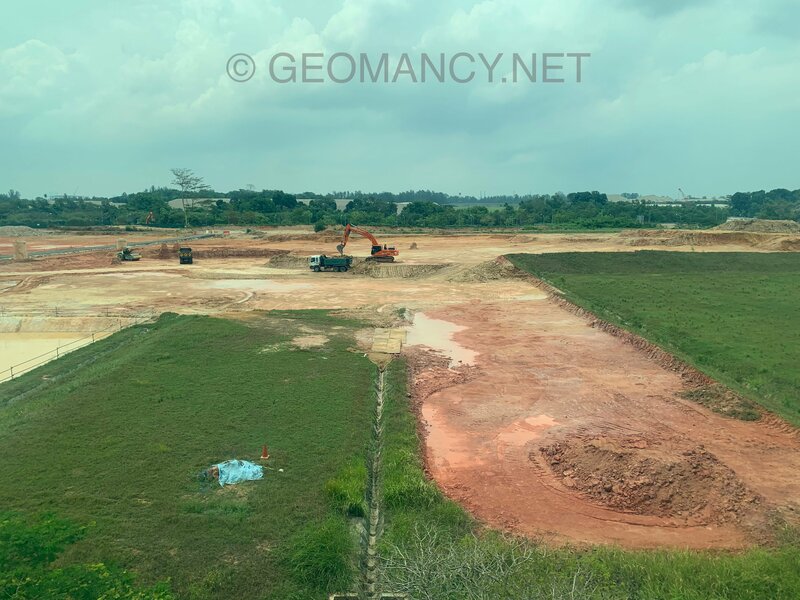 Based on the above Estimated Completion Date, under Flying Stars Feng Shui; this development would have been completed under Period 8. But when we prepare an individual Feng Shui Chart, will certainly discuss especially the wealth luck also from 2024 onwards, due to a change of Qi. 1. 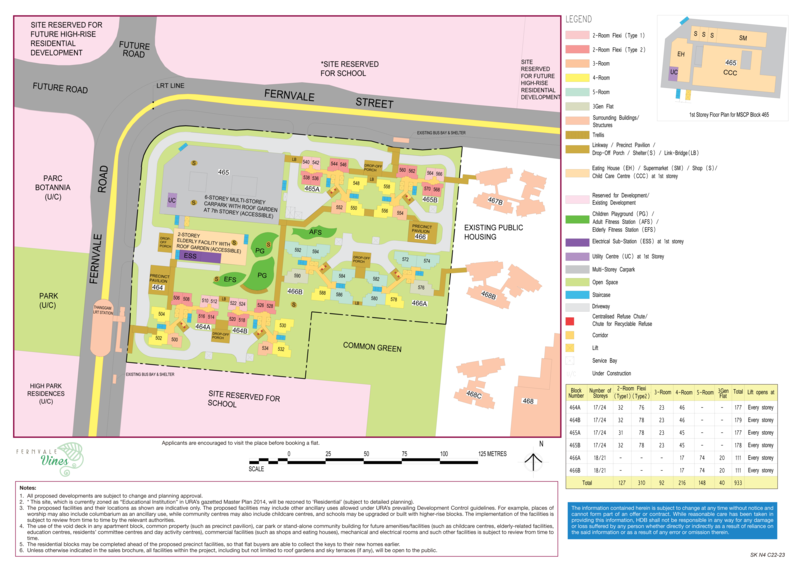 The planners did a good job in placing the common rubbish bins centrally away from all units within each block. 1.1. 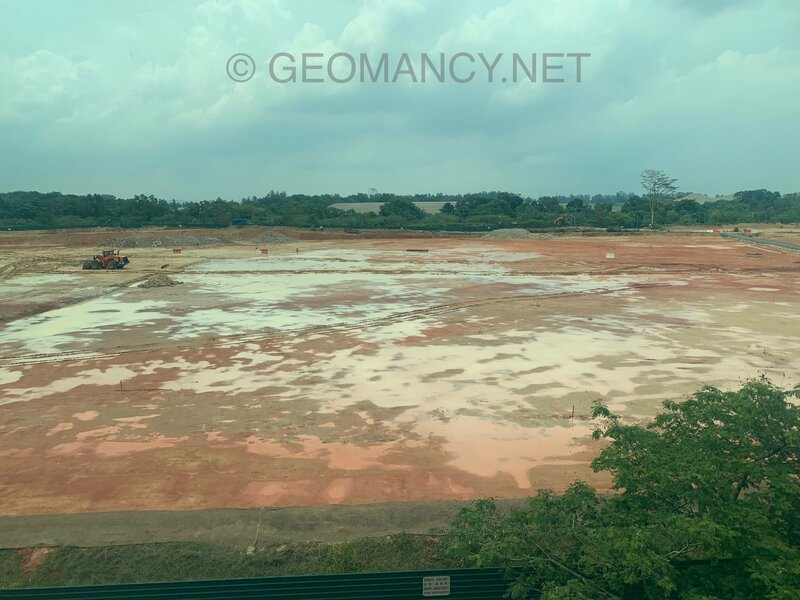 Thus unlike the HDB Boon Lay Glade (same Februay 2019 BTO launch); this development does not have stacks/unit's main door facing the common bins nor very near-by to it. 1. How do I know if my unit is affected by a poison arrow? 1.1. 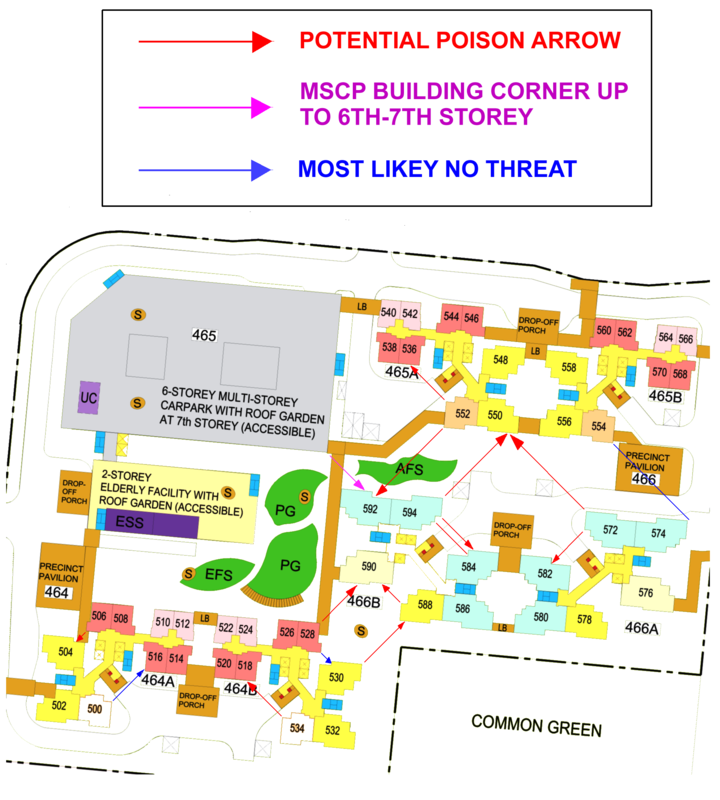 From the site plan, one can only roughly estimate the probability of a potential poison arrow. 1.2. What is more important is that if the sharp corner is not aimed towards an opening such as a window then it is a non-issue. 2. Above. For Block 466B stack 502 between storeys 1 to 7 = can be affected by the sharp corner of the MSCP aimed towards perhaps a bedroom opening. 1. 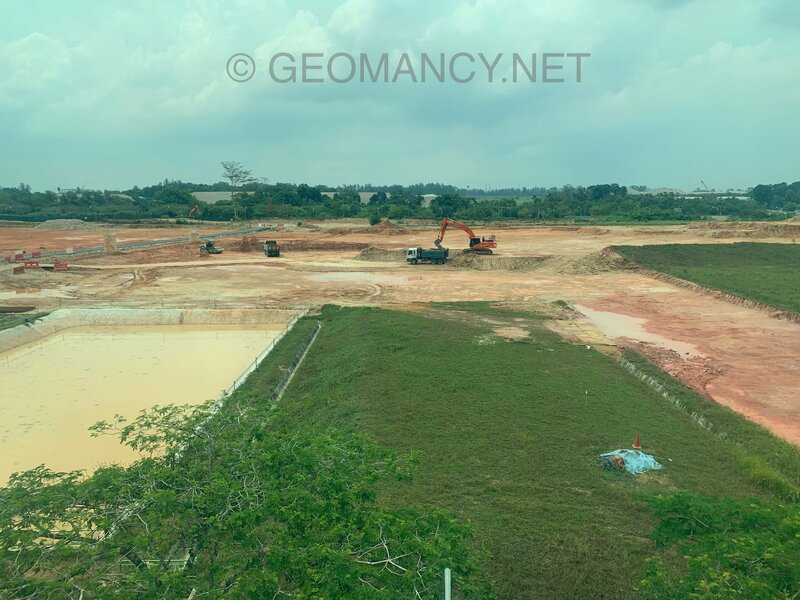 Your checklist for purchase of a unit at Fernvale Vines should include the consideration of low level flats that has a view into one of the two PPs in this development. 2. Low floor stacks close-by to the PPs should also be taken note of. As sometimes, religious prayers and ceremonies are performed at these PPs. 1. 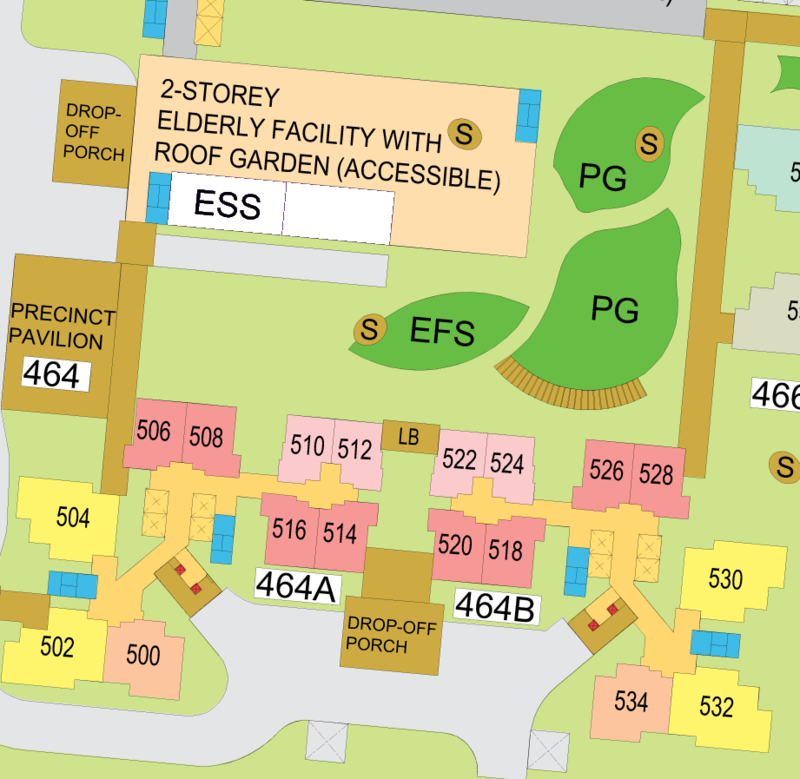 The planners of this development has done an acceptable job to incorporate the ESS together with the 2-storey Elderly Facility with roof garden access. 2. This ESS is quite a distance away from the nearest stacks: 506, 508, 510 and 512. 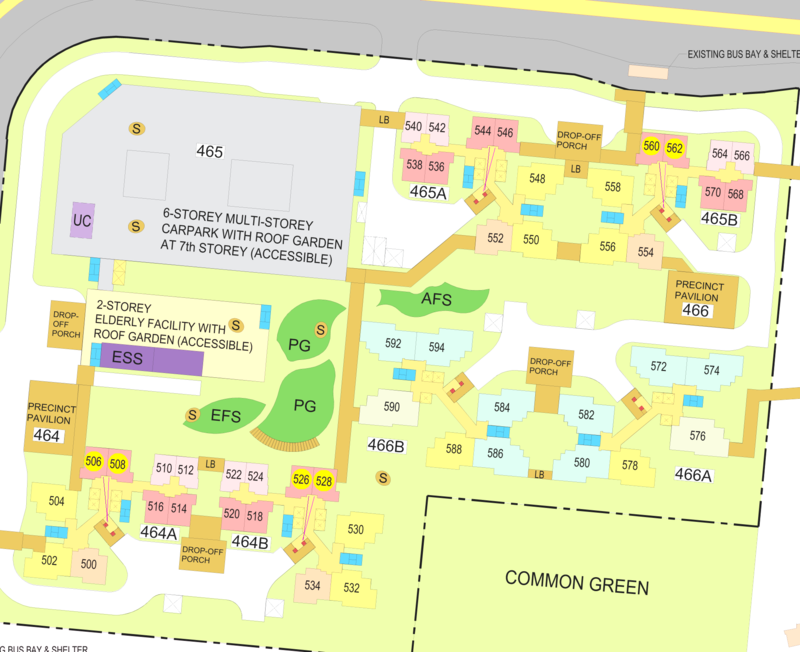 Thus overall for the majority of stacks/units in Fernvale Vines.. can be considered a non-issue. 1. 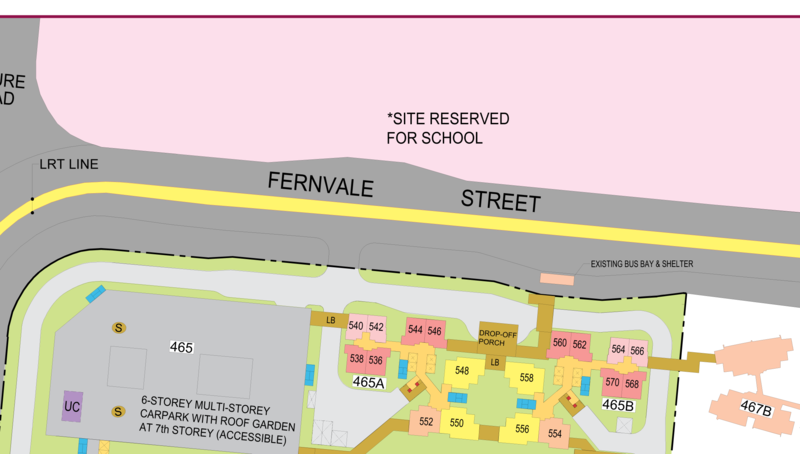 Above: Directly south of Fernvale Vines plot of land, is a site reserved for a school. 2. 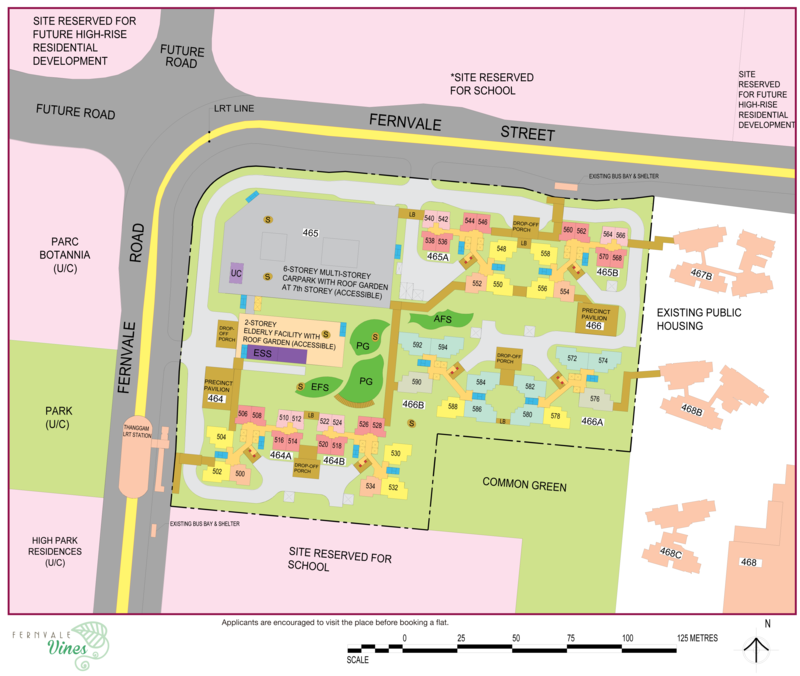 Below: While to the north of this site is another site reserved for another school. 3. Should I be concerned? 3.1. 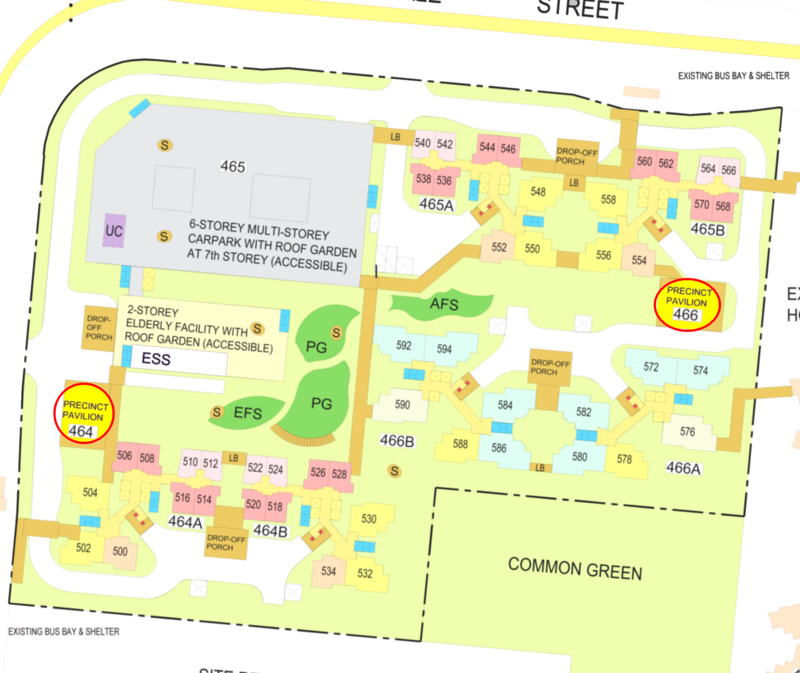 Yes, if one's unit directly faces a construction site especially since blocks 464A and 464B south facing stacks are next door neighbours to this reserved site. 3.2. 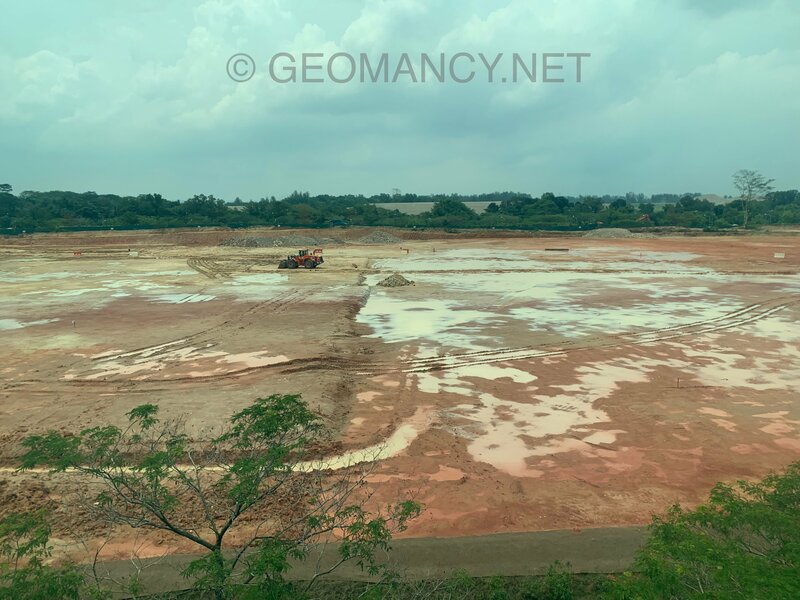 Noise pollution and dusts throughout the construction of the school(s). Often this lasts 2 to 2 1/2 years or more. 3.3. Luckily not many, but there are a group of Feng Shui practitioners and even common persons who felt that staying facing a school is not ideal. 3.3.1 Their main concern is that after school hours, there is no activity within the compound of a school. If so, in the evenings.. they consider a school as having a YIN environment. 3.3.2 Technically speaking this is true. But, generally, the morning and afternoon activities of so many young persons is like a burst of Yang Qi during the daylight hours. 1. 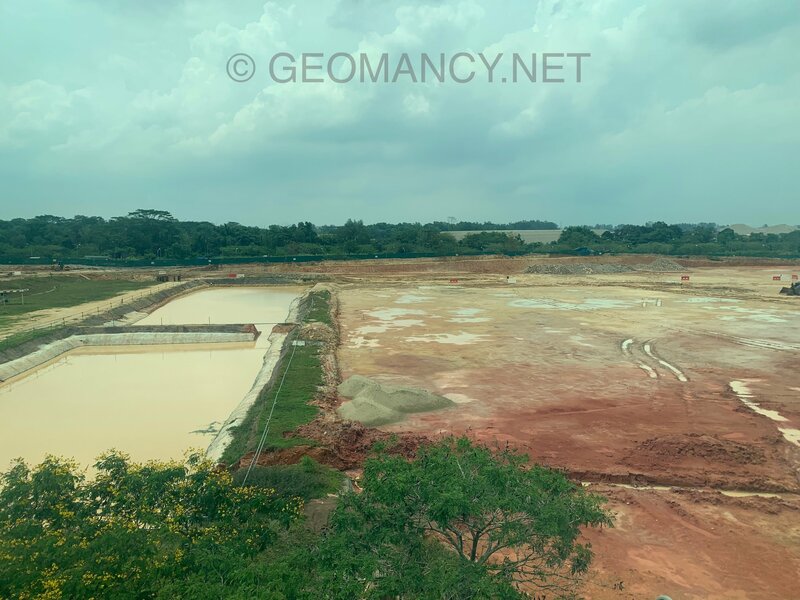 Then Seletar East Farmway land was for agriculture, pig rearing and poultry land. 2. 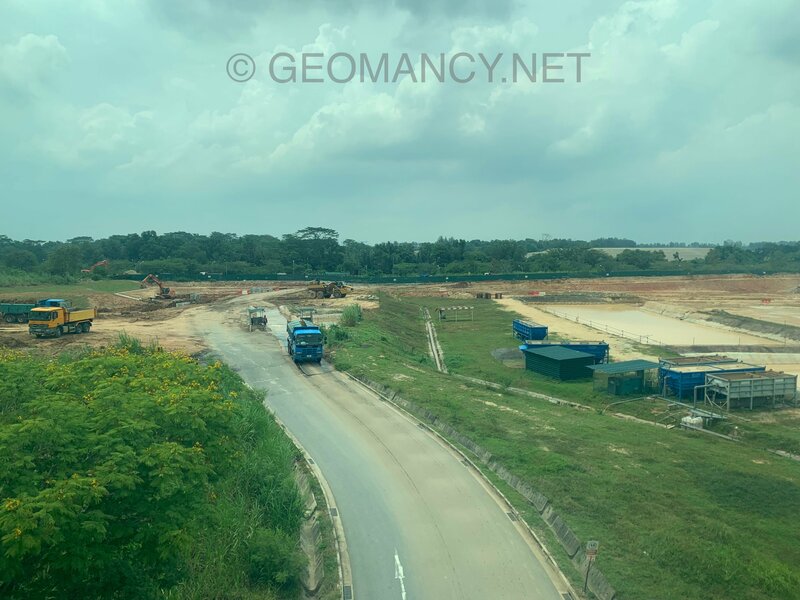 Between 1978 to 1980's, I had to attend: Clerk Class II, Clerk Class I, NCO II and NCO I at School of Manpower, Seletar West Camp and we had to travel past Jalan Kayu. And once we reached Yio Chu Kang leading towards Jalan Kayu road, the distinctive smell of pig farming permeates through our army vehicles. 4.1. 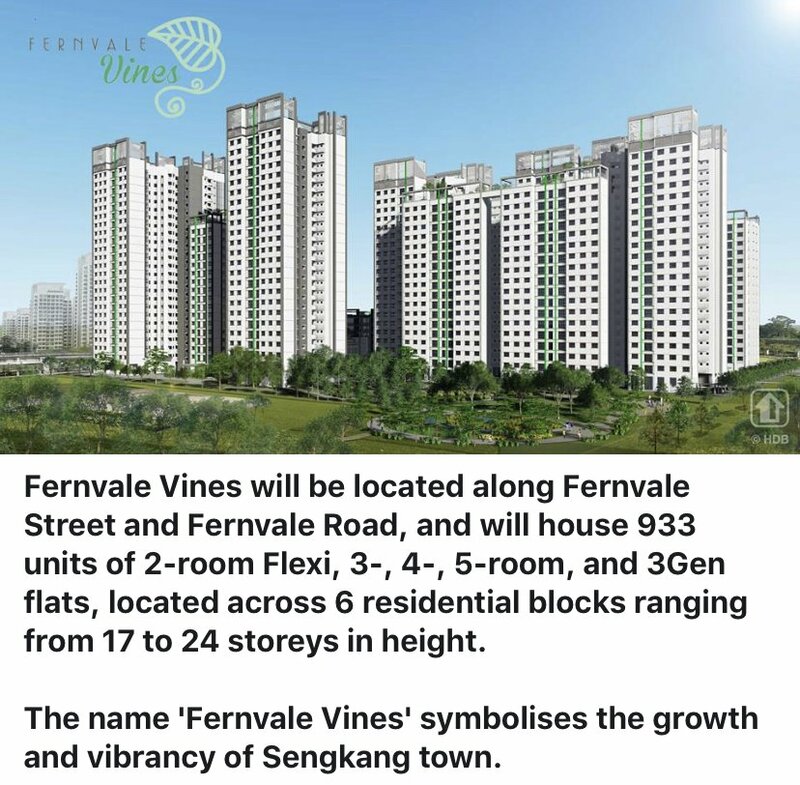 Fernvale Vines once sit on Lorong Kechapi and fringe of Lorong Chengai. Of course, these roads are no longer around. 4.2. Did you manage to see a former market? Yes, a market. 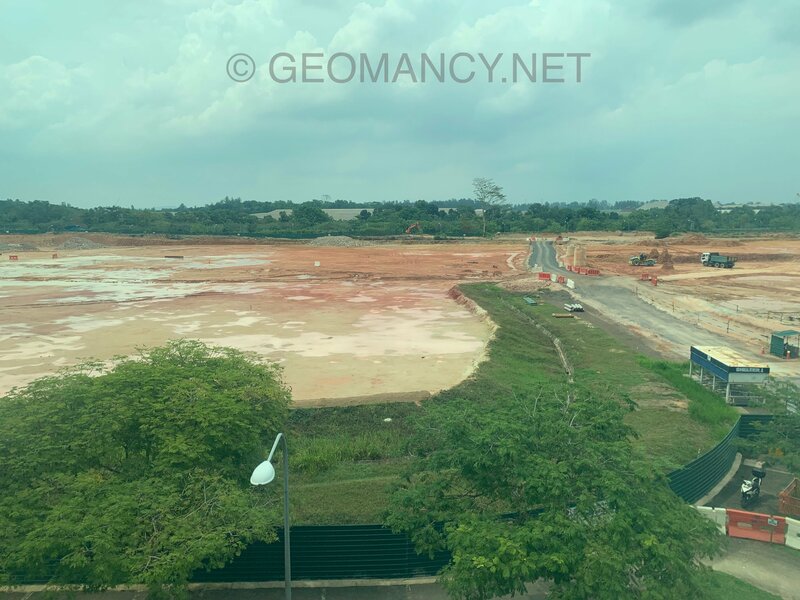 It is to the West of Fernvale Vines / Parc Botannia! 4.3. This area has quite a rich history. 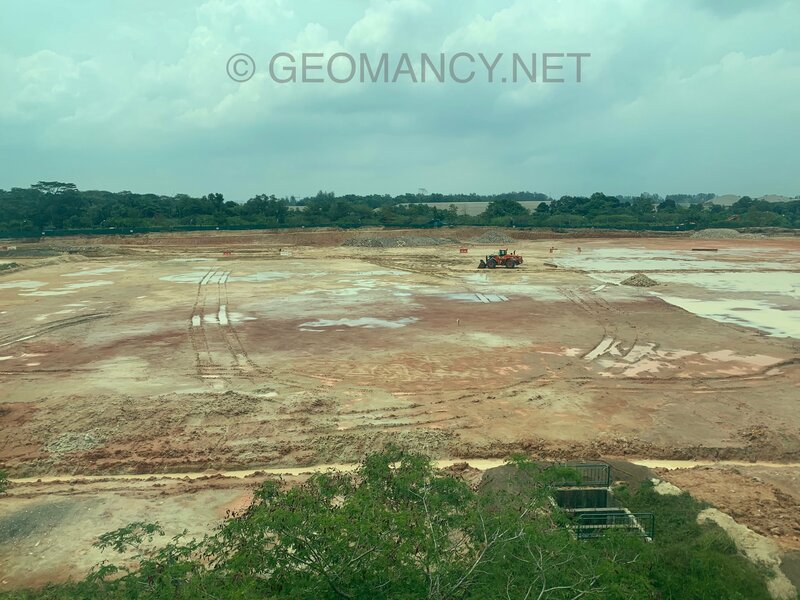 Given that it is South of the former British Seletar Camp. Please read this before (happily) posting a question. 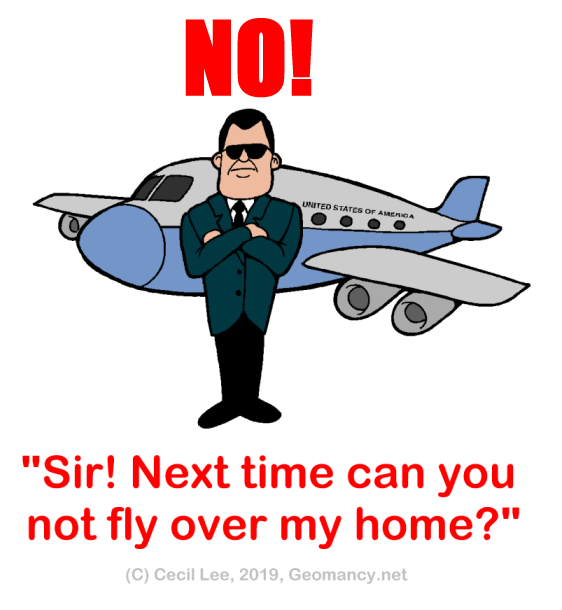 Part 7: Is there frequent aircraft/helicopter noise since Fernvale Vines is so close to the Seletar Airport? 1. One consolation is that many parts of Singapore have aircraft fly past. Some clients have feedback from Punggol, Tengah and even East Coast. 2. 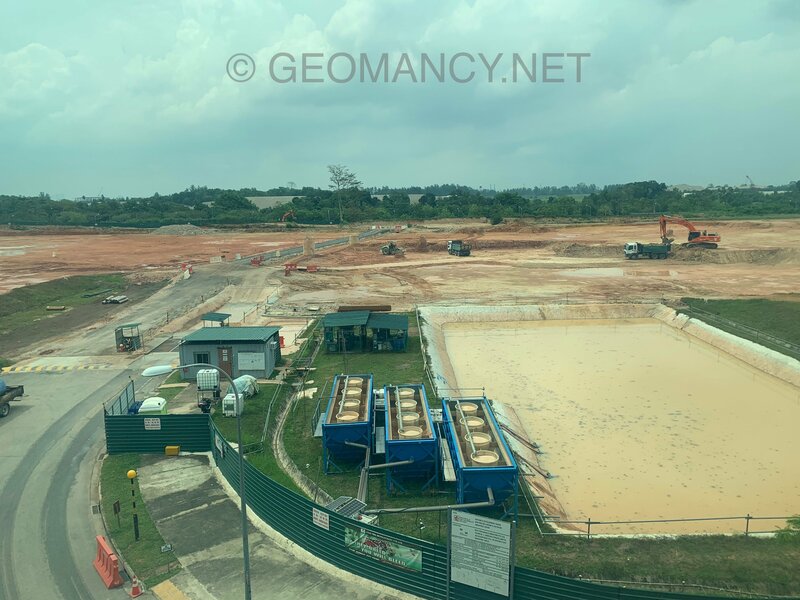 For now around Paya Lebar area... but when the airbase is moved to Tengah... this is history. 4. Question: So how huh? Your guess is as good as anyone else! 4.1. 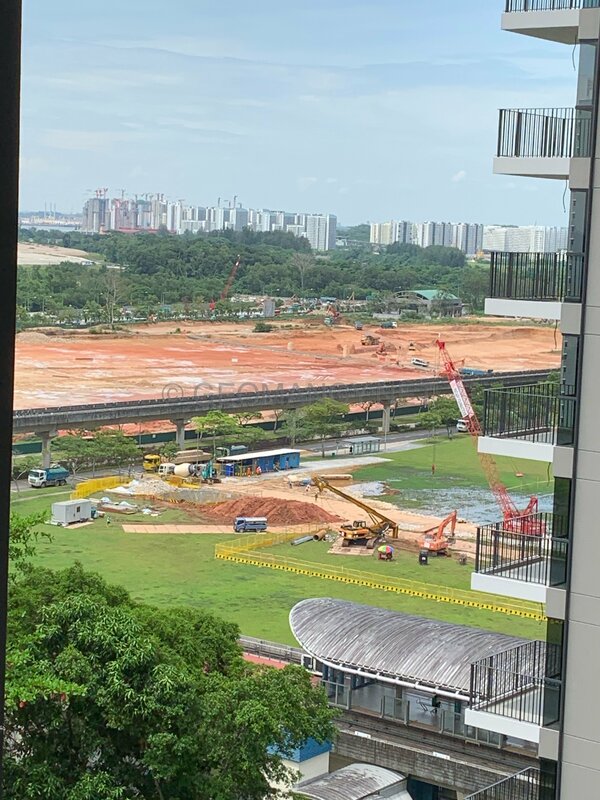 Check around, the web, friends etc.. any such issues around Sengkang West = Fernvale area? Your agent: "This location very good you know! South of the Aviation Hub! Rolls Royce is just a few kilo-metres away! Potential buyer: "But... I work in the city leah! How huh? And nowadays the LRT trains are so packed!" Your agent: "You can always rent out the place!" Potential buyer: "IF so, I don't have anywhere else to stay!!" Your agent: " Okay, NEXT! (this fella is out)" Not my potential buyer at this area. LOL! 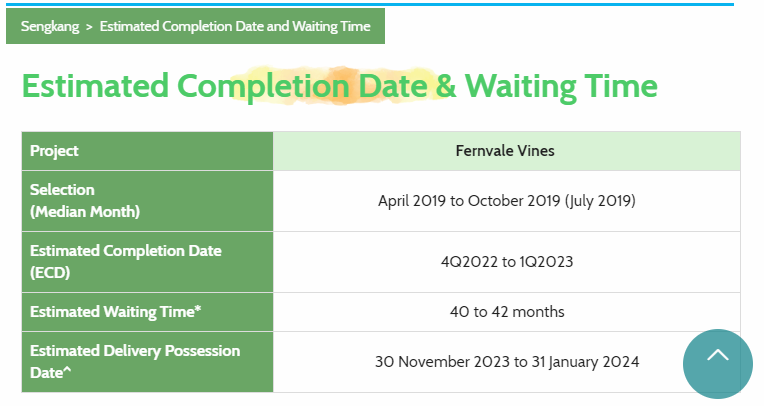 Frankly not serious but can be a stigma especially if either relatives, friends and even later outsiders who have a interest in the future to purchase a unit at Fernvale Vines. Hello Master, thanks for sharing your analysis of this BTO project. Some stacks have their front doors directly facing their neighbours' front doors, such as 584 and 586, 580 and 582 as well as 530 and 532, among others. What are the fengshui considerations when selecting stacks with these features? Are there any cause for concerns? Also, re #2, I've heard this could lead to quarrels between the two affected families, is this true? 1.1. In fact, many, many Condos and EC developments have this situtation. 1.2. 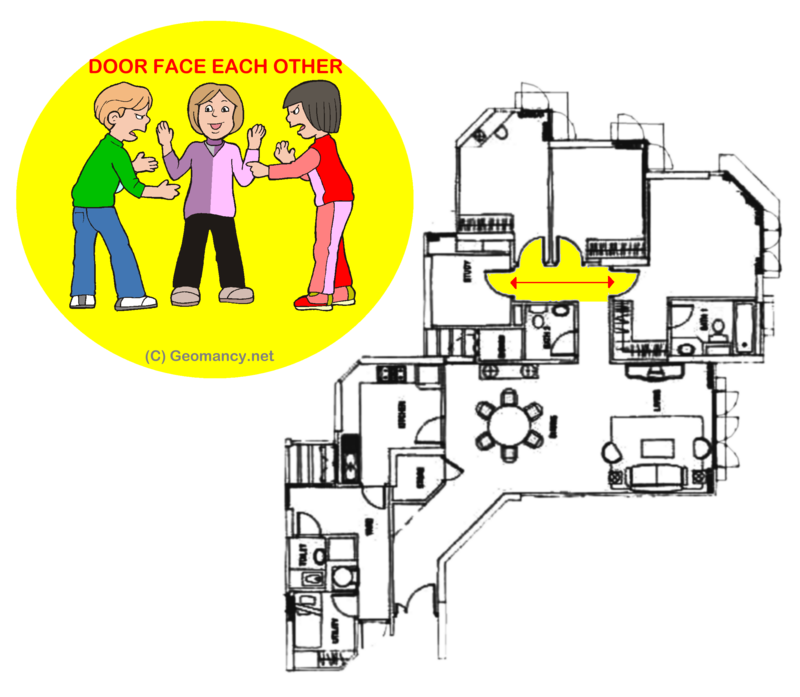 In this example: it is a bedroom door facing another bedroom door. 1.3.2 Sometimes the neighbour may encroach into "your common corridor" eg. extra large shoe cabinet(s) and or placing plants and/or hoarding items. Such items are such an eye-sore and irritation especially if you are the "neat and tidy" type. 1.3.3 Some neighbours threw their shoes and sandals all over and even spill over to your unit. 2. You wrote: "There are stacks with front doors either facing the staircase or are located next to the staircase;"
2.2. Under symbolism in Feng Shui, it is considered inauspicious for a main entrance to face a staircase that goes down to a lower floor. It symbolises wealth flowing downwards. 2.3.1. This has to do with common sense! If higher floor occupants need to evacuate.. such exit doors MUST BE able to CLOSE after people enter the stairs = are to prevent any smoke or fire going into the stairwell! 3. For the last reason under Para 2.3. 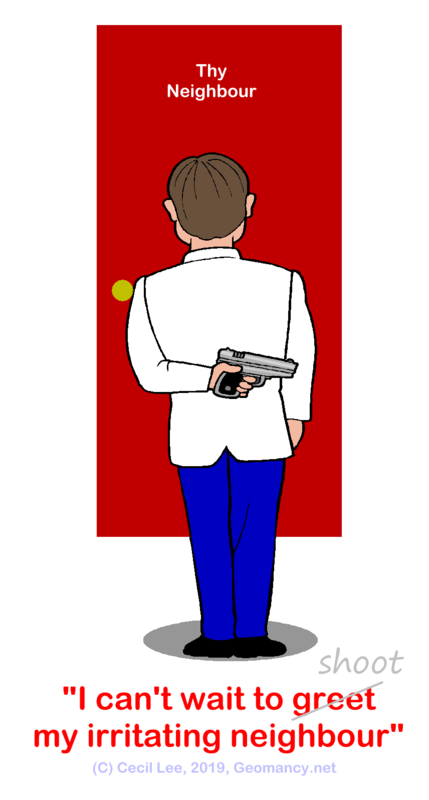 If the stair-case door is always closed; then the concern you mentioned does not apply. But if someone keeps on leaving the door opened.. then this can be reported and in the end, the final verdict is that one can win the case - if so. Morale of this information: Please note that majority of Feng Shui considerations are based simply on pure common sense! Thus each time when I approach any subjected matter, I will always ask myself this: "Has common sense have to do with this?" You will be surprised! That not everything has its origin from/in Feng Shui! For example, my toes keep on laughing whenever I find the reasoning that one's bed should have four legs. And the explanation was: " To allow good qi to flow below the bed!" If you do come across a Feng Shui Master that says this.. please ignore the person like the plaque! Frankly, it has to do purely with common sense. If too lazy, one can even sent in a robot to clean that area! 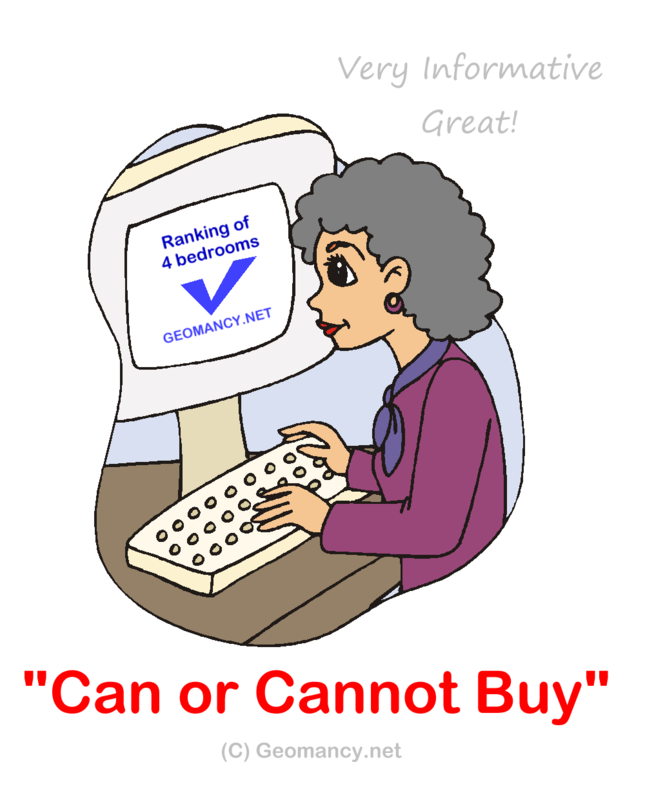 Part 9: Is price a Feng Shui consideration? 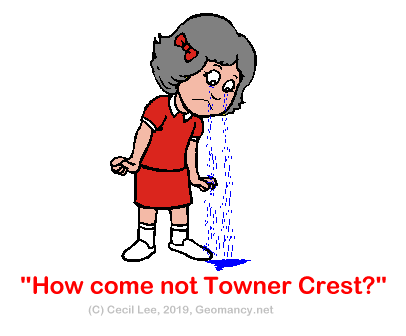 Daddy and mummy how come not Towner Crest? 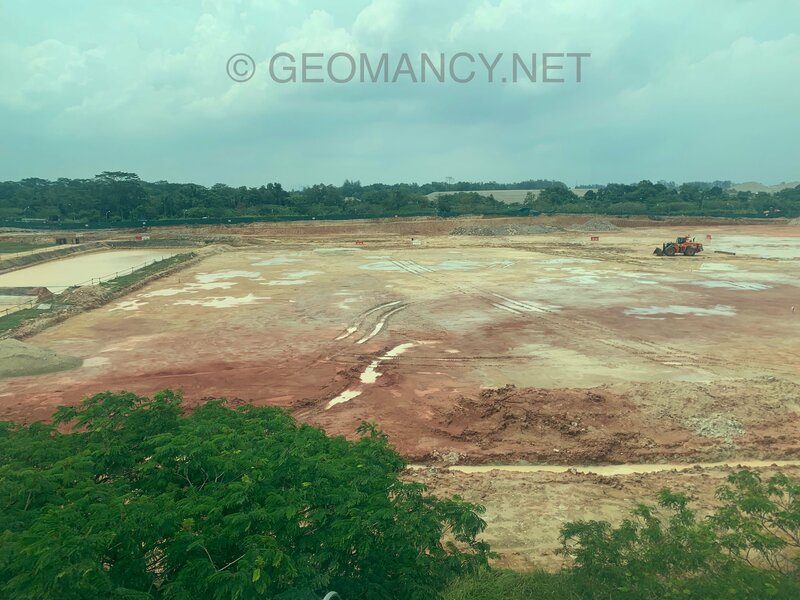 Daddy: Dear darling, you are still young to know that for certain locations especially mature estates and locations close-by or next to MRT stations, these flats are often sold at a premium! And unfortunately, I cannot afford these flats. Another reality check is: you know, your mum was retrenched and her job was stolen. Your daddy, also does not have an iron rice bowl. Daddy: In recent years, we had a wake-up call when the Minister of National Development announced that HDB flats have zero value when the lease is up. Daddy: So sorry; I know; nowadays Sengkang WEST LRT even with it's two trains is packed like sardines during peak-periods! Daddy: By the time we move-in; I will train your body to endure the potential squeeze in the trains. And prevent molestations. Or like some others.. hopefully.. the alternative is via bus. Daddy: Anyway, I got car what! I can be your Driver! Right! Darling baby! Sweet daughter: Daddy, by the time you collect your keys.. your car is already due for scrap! And you told me that by then you are forced to go without car! Remember! Sweet daughter: Nevermind... you are still my daddy and I love both of you very much! P.S. For condos and ECs units facing real water is often sold by the developer at higher premiums. Coincidentally, this perhaps coincide with the idea under Feng Shui that a home facing a pool of water is preferred. Note: This is purely fiction. Neither have I evaluated the pricing of each of the BTO. BTW, Feng Shui does not look at the price! Yes! Please call this FAKE NEWS! Not REAL! In addition. 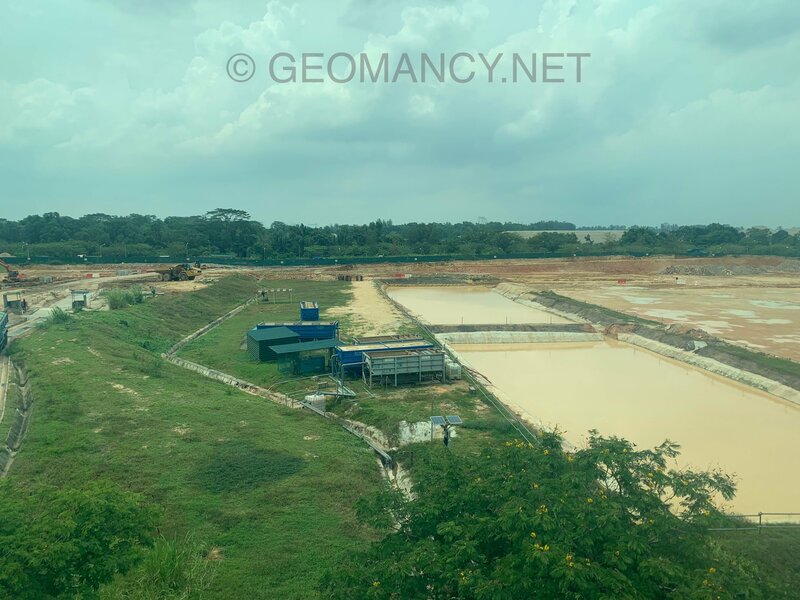 If HDB portrays or adopt a more "KIASEE" approach should also include: "Applicants are also encouraged to try out Sengkang West LRT & the Circle line before booking a flat during peak-hours." Why Circle line? For some, this is one of their life-lines... Got it? Get it? Another LOL, here. Hey! You failed to mentioned about the NE line? Are there any secrets? This is what had happened at Pasir Ris, Tampines and even Simei! Got it? Commercial Products sold in the name of Feng Shui? From Day 1, we have championed this: "When the buying Stops, the selling CAN!" Next several weeks, I will be around this area. As there is a Group Buy at the near-by High Park Residences Condo. 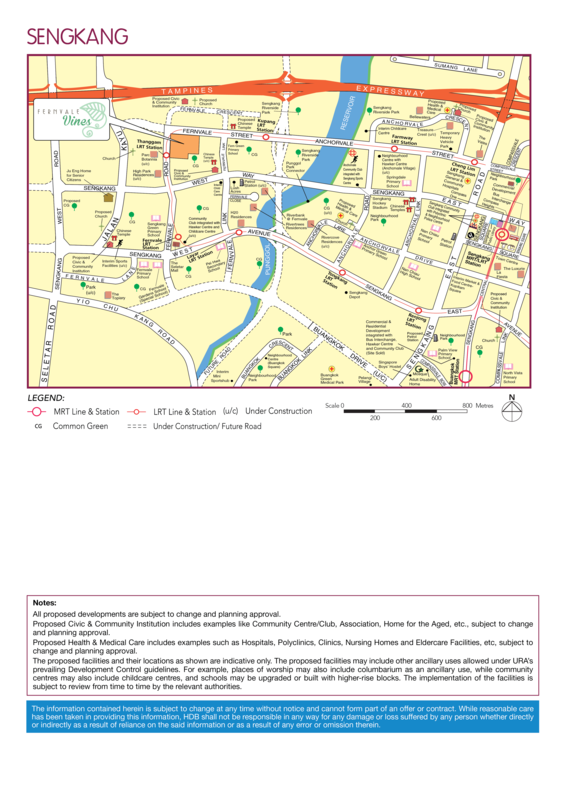 Useful resource especially if one is thinking of purchasing a private apartment.